Frostee Lynn Rucker (born September 14, 1983) is an American football defensive end for the Arizona Cardinals of the National Football League (NFL). He was drafted by the Cincinnati Bengals in the third round of the 2006 NFL Draft. He played college football at USC. 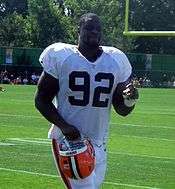 Rucker has also played for the Cleveland Browns. Frostee, named after poet Robert Frost, went to Tustin High School in Tustin, California, which DeShaun Foster, Matt McCoy, Chris Chester and Sam Baker also attended. He played running back and linebacker at Tustin HS and was named All-Golden West League MVP as a Senior in 2000. He attended Santa Ana High School during his junior year and earned All-League honors as a linebacker. He played both his freshman and senior years at Tustin High. Rucker attended Colorado State as a redshirt freshman before transferring and playing at USC from 2002 to 2005. Rucker was selected by the Cincinnati Bengals in the third round (91st overall) of the 2006 NFL Draft. He was placed on the injured reserve list his rookie year in 2006. In 2007, Rucker contributed on special teams and situational opportunities on defense. He started the final regular season game against the Miami Dolphins and finished with five tackles. In 2008, Rucker started 4 games and played in 11 (both career highs). He finished with 24 total tackles, two forced fumbles, and a pass defensed. In 2009, the Cincinnati Bengals won the AFC North and Rucker finished with 13 tackles, and an interception returned 26 yards. In the 2010 season, Rucker had 17 tackles, a sack, and a pass defensed. In 2011, Rucker had 44 tackles and four sacks. He also led all defensive ends in stops per snap percentage. Rucker at Browns training camp in 2012. Rucker signed with the Cleveland Browns on March 14, 2012. He was released during the 2013 offseason on February 5, 2013. Rucker signed with the Arizona Cardinals on March 21, 2013. Rucker was among a group of investors that placed a marijuana legalization initiative on the Ohio ballot in 2015. The initiative would have granted exclusive grow rights to Rucker and the other investors in the plan, but ultimately it failed to pass.